Islamophobia is defined as: a prejudice, aversion, hostility, or hatred towards Muslims and encompasses any distinction, exclusion, restriction, discrimination, or preference against Muslims that has the purpose or effect of nullifying or impairing the recognition, enjoyment or exercise, on an equal footing, of human rights and fundamental freedoms in the political, economic, social, cultural or any other field of public life. Islamophobia is more than hate crime but relates to barriers for Muslims across all areas of public life. This includes, but is not limited to, for instance: discrimination at work and failure to be promoted based on achievement; marginalisation from political positions; constant demonisation based on incorrect stereotypes in the newspaper media; and the inability of state institutions to provide equal levels of access for Muslims as per other religious or identifiable minority groups. 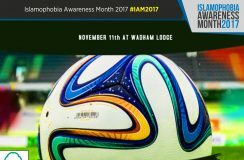 What is Islamophobia Awareness Month IAM? 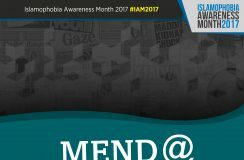 Islamophobia Awareness Month (IAM) was co-founded by MEND with other British organisations in 2012 to deconstruct and challenge the stereotypes about Islam and Muslims. 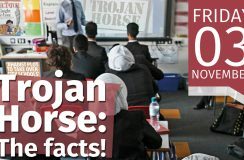 The month long campaign, held every November, aims to work with Police and Crime Commissioners (PCC), local councils, journalists and local media outlets, councillors and local MPs, mosques, universities, schools, community organisations and others to raise awareness of the scourge of Islamophobia and encourage better reporting of incidents to the police. 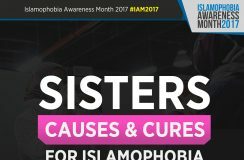 IAM raises awareness for the wider community of how Muslims are discriminated against in various spheres, along with providing information on the positive contributions of Muslims to the UK. It helps break down barriers and challenge incorrect stereotypes people may hold about Muslims, as well as providing an avenue for non-Muslims to engage with Muslims in a positive and uplifting manner. IAM also highlights why it is crucial for Muslims to report Islamophobic hate crimes to authorities in order for accurate data to be collected on the scale of Islamophobia and for policy changes to be enacted accordingly. Between March 2016-March 2017, 143,920 Tweets were sent from the UK that are considered to be derogatory and anti-Islamic – this amounts to 393 a day. NSPCC has reported an increase in helpline calls relating to racial and religious bullying or hate crimes in Manchester and London. In the two weeks following the Manchester Arena attack in May, Childline held nearly 300 counselling sessions across the UK, whilst the number of calls after the Westminster attack in March almost doubled to 128. The Metropolitan Police Service recorded 1,665 Islamophobic offences in 2017/18. Studies have demonstrated that there are 21 negative references to Muslims within British media output for every single neutral or positive reference. 50% of women wearing the hijab feel that they have missed out on progression opportunities because of religious discrimination and that the wearing of the hijab had been a factor. Islamophobia is a systemic problem that manifests itself across society in various ways, at times clearly noticeable and at other times more subtly, resulting in the exclusion of Muslims from fully enjoying their freedoms, rights and opportunities as equal citizens. Muslim children encountering Islamophobia in the playground and being called “terrorists” and being told “go back to your country”. Childline in 2015/16 provided 981 counselling sessions because of racist/faith-related bullying. Following the Manchester Arena attack in 2017, Childline provided 300 sessions because of religiously-motivated bullying. The UK’s counter-terror apparatus, PREVENT, being used to inappropriately flagging students for their views and stifling legitimate discussion. CVs with Muslim names are three times more likely to get rejected compared to English-sounding names despite having identical skills and experiences. One in eight Pakistani women have been illegally asked at interview about their future plans regarding marriage and family – compared to one in thirty for White women. Inaccurate headlines being published on a regular basis with no adequate sanction or deterrent for newspapers. Demos noted that between March and July 2016, there were an average of 4,972 Islamophobic tweets every single day. Mosques and Muslim community centres being vandalised, set on fire and targeted with bomb threats. Muslims being deliberately targeted with violence and being run over in terrorist acts. Nearly 6,000 religiously motivated hate crimes were recorded by police services in England and Wales in 2016/17. Policies being enacted which constantly frame Muslims under light of the “counter-terrorism” narrative. Muslims being disproportionately stopped at airports for reasons as spurious as reading books or returning from pilgrimage. Equality and Human Rights Commission noted that it was 11.3 times more likely for an Asian to be stopped compared to their White counterpart. 80% of Channel referrals prove unwarranted and thus only serve to stigmatize and victimize individuals. MEND partners with various organisations in promoting and facilitating IAM events, in order to reach a wider and more powerful audience. These organisations include but are not limited to: National Union of Students, Stand Up to Racism, Bristol City Council and British Transport Police. Waltham Forest Games Night – MEND held a quiz night educating participants about the contributions British Muslims have made to the UK through an engaging evening of riddles, board games and prizes. “Ask a Muslim” event in Caerphilly – audience members were free to question Muslim academics and volunteers on a number of topics regarding Muslims and Islam, including the veil, feminism and Islam and Sunni and Shi’a views. IAM events you could hold include: panel discussions, quiz nights, film screenings, community dinners, library talks, sports tournaments and many more! “Childline bullying report 2015/16: What children are telling us about bullying”, NSPCC, 2016. Accessed: 23rd July 2018, https://www.nspcc.org.uk/globalassets/documents/research-reports/what-children-are-telling-us-about-bullying-childline-bullying-report-2015-16.pdf. May Bulman, “Muslim children as young as nine branded terrorists in wake of recent terror attacks, reveals Childline”, Independent, Wednesday 28 June 2017. Accessed 28 September, 2018, https://www.independent.co.uk/news/uk/home-news/nine-year-old-children-terrorists-race-faith-hate-bullying-childline-manchester-arena-terror-attack-a7810051.html. “Preventing Education? Human Rights and UK Counter-Terrorism Policy in Schools”, Rights Watch UK. Accessed 28 September 2018, http://rwuk.org/wp-content/uploads/2016/07/preventing-education-final-to-print-3.compressed-1.pdf. Zack Adesina, “Is it easier to get a job if you’re Adam or Mohamed?”, BBC News, 6 February 2017. Accessed: 28 September 2018, https://www.bbc.co.uk/news/uk-england-london-38751307. “Forgotten Women: the impact of Islamophobia on Muslim women”, ENAR. Accessed 6 June 2017, http://www.enar-eu.org/Forgotten-Women-the-impact-of-Islamophobia-on-Muslim-women. Paul Baker, Costas Gabrielatos, and Tony McEnery, Discourse analysis and media attitudes: the representation of Islam in the British Press (Cambridge: University Press, 2013), p2. Carl Miller and Josh Smith, “Islamophobia on Twitter”, Demos, 18 August 2016. Accessed, 28 September 2018, https://www.demos.co.uk/project/islamophobia-on-twitter/. “Hate crime, England and Wales, 2016 to 2017”, Home Office, 17 October 2017. Accessed, 28 September 2018, https://www.gov.uk/government/statistics/hate-crime-england-and-wales-2016-to-2017. “Year end crime statistics 2017/2018”, Metropolitan Police Services. Accessed, 28 September 2018, https://www.met.police.uk/sd/stats-and-data/met/year-end-crime-statistics/. Homa Khaleeli, “The perils of ‘flying while Muslim”, The Guardian, 8 August 2016. Accessed, 28 September 2018, https://www.theguardian.com/world/2016/aug/08/the-perils-of-flying-while-muslim. Alan Travis, “Asian people 11 times more likely to be stopped at UK borders, analysis finds”, The Guardian, 5 December 2018. Accessed, 28 September 2018https://www.theguardian.com/law/2013/dec/05/asian-people-stopped-uk-borders-analysis. “”Five children a day” referred to Channel,” MEND, June 21, 2016, accessed April 12, 2017, http://mend.org.uk/fivechildren-day-referred-channel/.